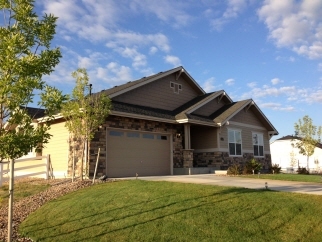 Description: Impeccable 1.5 yr old ranch in popular eagle shadow! Situated on one acre, this home features an open floor plan perfect for entertaining & has all the upgrades. Granite, stainless steel appliances, wood& tiled floors. Private master suite w/covered patio access. A full basement & great neighbors. Conveniently located just minutes from i-25 and e-470. You don't want to miss this one!